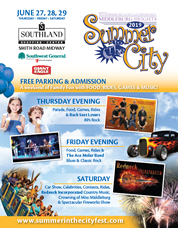 What are the times of the Summer in the City Festival? Are there Amusement Ride Presale Vouchers? How much are they and where can I get them? How do I apply to perform or be a vendor at the festival? How can my group participate in the parade on Thursday, June 22nd? Q: What are the times of the 2019 festival? A: Thursday, June 27th, 2019: 5:00p.m. to 11:00p.m. Friday, June 28th, 2019: 5:00p.m. to 11:00p.m. Saturday, June 29th, 2019: Noon to 11:00p.m. Q: Are there Amusement Ride Presale Vouchers? How much are they and where can I get them? 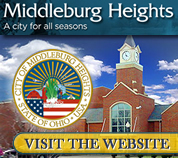 A:: Presale Vouchers for the Middleburg Heights Summer in the City Festival will be available from June 3, 2019 through 5pm June 26, 2019, or until sold out, at the Middleburg Heights Community Center (16000 Bagley Road, Middleburg Heights, Ohio 44130). Amusement ride presale vouchers are sold on a first come, first served basis. The vouchers cost $12 ($3 savings off the regular price of $15). For more information, contact the Middleburg Heights Community Center at 440-234-2255. Q: What time is a particular performer playing? A: The full Entertainment Schedule is posted here. Times are subject to change, so check back often. Q: Who do I contact if I have specific questions about the festival? A: Use our Contact Form on this page to request specific information about the festival. Q: How do I get to the Summer in the City Festival? A: Southland Shopping Center is located approximately 1 mile east of I-71 at the Bagley Road Interchange (Exit 235). Please see the Directions/Maps page to get specific driving directions from your location. Q: Is there stuff for kids? 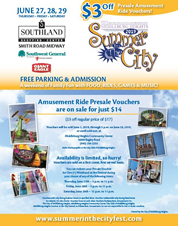 A: We have lots of activities for children, including amusement park rides, carnival games, inflatables, and more. Again in 2019, we'll host our Kids FunTime - a special area for children that will feature face painting, balloon sculpting, and other activities. A: There is a wide range of food available including Philly Steak Sandwiches, Italian Sausage, Corn Dogs, French Fries, Hot Dogs, Burgers, Italian Sub Sandwiches, Nachos, BBQ Pork and Chicken Sandwiches, Funnel Cakes, Cotton Candy, Gyros, and other traditional festival fare. Q: How can my group participate in the parade on Thursday, June 27th, 2019? A: Please contact Recreation Director Jeff Minch at the Middleburg Heights Recreation Center [440-234-2255] to inquire about participating in the parade.